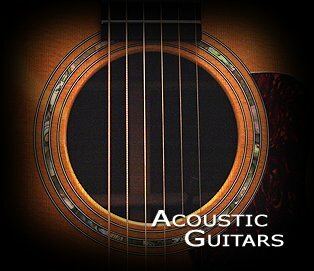 There are so many great acoustic guitars. I've owned many hundreds in my life and each was a special friend, indicative and transcendental to a moment in time. Each guitar has its own personality. Like children they can be temperamental and they need time and help to grow properly. Its a funny thing, but I can tell almost immediately how an old guitar has been played the minute I pick it up. I can tell if it was owned by a player or a collector. I can feel how much effort its owners put into appreciating its sound. And old guitars are not the only ones with personality. Most new ones definitely have a character as well, a little green, unquestionably inexperienced perhaps, but still waiting eagerly to join and contribute to the world of sound. Doesn't really matter if it was the product of skilled hands or clever machines, each guitar has potential. Most need only a proper set up to begin the journey earnestly and once begun, under the just right, neo-magical conditions, a whole new universe is born. A universe of music. I can think of no finer quest. Those who know me and those of you who are reading this publication, will quickly begin to understand that I like nearly all guitars. Never met one (with VERY few exceptions) that I couldn't make some special sound with, some special moment for myself and the listener. I own a lot of guitars and I have access to many more. One of my favorites brands (its a little like deciding which of your children are your favorite) is the Legend guitar www.legendguitar.com. Hand made beauties that can keep up with my rigorous schedule and not get weirded out every time it rains and can sing as sweet as a mockingbird. As an intro to this section, I choose not one of the hand made Legends, but a factory made Legend of their TOUR Series (a series I helped name) because it demonstrates, better than words, just how special even reasonably priced, machine-made guitars can be. The Legend D112SFTGT is a thousand dollar retail guitar but in the right creative hands, it could buy the world. Click on the graphic above left to hear an mp3 of this highly road worthy, working man's dred. Incredibly successful music has been created and performed on far less worthy instruments. Like I said, I have lots of guitars. Many old Martins, Guilds and Gibsons, most of which are retired into storage for now as well as four Legends, a number of Takamines, Taylors and others. Each one I keep with me has a special voice I need at certain times. My hand-made Legends are the closest thing I own to a "boutique" guitar. I have seen many pretty faces and some with voices to match, but I am a bit old fashion in the idea that a $7,000 dollar guitar may be a bit like a spoiled brat among my normal instrument children. I am slowly overcoming this prejudice. You have to remember that, until relatively recently, there were only a handful of respected builders. Today there are literally hundreds of great builders with more cropping up daily. These small-run artisans make stunning creations and price not really being the object, I should have more of them. The collector market (of which I am not a part) has gotten so out of whack with reality as far as the price for vintage instruments (mostly Martins and Gibsons) that seven grand is not necessarily too high a price to pay for a new guitar, but only if the instrument says something very special to you. Still I have hesitated. I would never have toured with an instrument like these, but in the studio, some really do have such a dramatic sound that they can be fiscally and artistically justifiable. Unfortunately, many of these instruments wind up in the hands of those who are least able to play them. Over the course of the next many months you will get a chance to see and hear, in depth, representatives of this genus of instrument. The pros don't use them that much, at least the commercially successful touring and recording artists. They still use Martins, Gibsons, Taylors, and Takamines, with a few Santa Cruz, Gallaghers, and a rare Olsen thrown in the mix. Even chart topping pros who can well afford anything they choose, won't take instruments of that value, or that are climatically sensitive, on the road. The touring player needs road warriors not art work. They are playing large venues often with large ensembles where the special sonic beauty of an instrument in this category would likely be overshadowed anyway. Of course, certain musical styles attract the gaudy, dripping with faux abalone, decorative panache of the $50,000 Martin GE D45, but these are rarely more than props. It has been this way in country music for a very long time. But the Porter Wagoner look may be coming to a close. However, as the music business continues to evolve, many more players will find successful work in studios and in the film industry where a special guitar need not meet the rigors of the road. Likewise, builders such as Mike Doolin of Portland have taken some seriously ingenious steps into the next century of guitar building with innovations like adjustable neck angles and double cutaways that are stable and highly responsive and are truly flexible in performance. And like I said, there are more truly spectacular looking and sounding instruments available today than ever before. A lot more! One such builder, who especially attracted our attention, is Gerald Sheppard of Kingsport, Tennessee. One would be hard pressed to find more beautiful looking instruments than Gerald produces. We were curious, so we asked Gerald if we might take one for a spin. His website is beautiful www.sheppardguitars.com and that does say a lot about his sense of taste. Still, we had no idea if this was just another pretty face or if there was a voice to match. You can expect to pay from about $5k (4800) for a basic (hardly basic in reality) model to $7500 or more for top of the line appointments. Takes about 6 months for the process. He builds his guitars for sound and uses the same top notch Master Grade woods and materials in even the least decorative of his creations. While speaking with him, we were hard pressed to even discuss decorative appointments as his focus continued to return to the issue of sound and playability rather than glamour. That we liked. At his site you will see that he knows how to put on an dramatic, eye-dazzling design showing but we wanted to play, hear, and share with you the sound these beautiful instruments were capable of producing. The following video is one of several we produced. We are leaving for a road trip soon and when we return, (around the first of April) the entire group of demos will be mixed and rendered to show the amazing flexibility of style we found in the Sheppard design and tone. These guitars are very light - less than four pounds - a bit lighter in fact than his average instrument for the Grand Concert Gerald sent. However, we found it to be extremely stable, even outdoors at night in fifty degree weather. The sound should speak for itself. If you don't have good speakers on your computer, follow the instructions below and download the mp3 file and then put it on a CD to use in a better system. In the studio, this guitar found its true home, but it is certainly stable enough for a careful road trip as well. After all he flew it to me and has sent this instrument to a number of well known players and it is still in one beautiful piece. Now I have no intention of overselling any of the instruments we will look at now or in the future. We will leave "opinions" up to you, our readers by providing high quality audio and video such that you can hear each of these instruments in their best light. There will be many more guitars to show you when we return, of all price ranges, but I think this is a fun and very instructive first glance at things to come. Enjoy the Sheppard - We certainly did. Once again the WMV's are for Windows users and the MPG's are for the Mac World. The MP3s are for both. To download any audio or video from this site for your personal use only, (*see copyright notice at page bottom), right click the graphic thumbnail below and select from the drop down menu that appears, "Save Target As". Pick a folder and it will be yours. To watch the video online simply click the thumbnail. Specs for the Sheppard "Ave Maria"
Saying goodbye to this Sheppard Ave Marie ( www.sheppardguitars.com ) was not an easy thing. However, it is now on its way back to Gerald and it will be sorely missed. We recorded an awful lot with this guitar, some of which we will share now and some we recorded at higher resolution for later use with strings, keyboards, bass and other instruments in more dense mixes that we will explore with you in the future. This instrument is an ideal choice for such arrangements. The strings on the instruments were D'Addario Light EXP's and after two weeks of rather intense playing, they lasted pretty well. By the time these last few videos (and mp3s) were created, the strings had reached what, for some people, might be considered a little dead. However on the Sheppard as with most of my best studio instruments, it is that mellow "golden" tone, that a truly fine guitar offers, especially when the strings have been well broken in, that is my most sought after sound. We think you will enjoy the following pieces as they show a good bit of the range and flexibility of this instrument. The time and care Sheppard and other fine hand builders employ with small but vital details like fully compensated saddles (for each string - shown below) make this class of instrument well worth the price. If you can't yet afford this level of instrument - and many can't - as yet, keep to the task of creating NEW music rather than copying existing styles or known performers and you may one day soon find yourself most easily in that price range. New music can be gold. Again, you don't need this high cost instrument to be extremely successful in music, but I will tell you, for writing melodies especially, it sure can make the task both much easier and infinitely more pleasurable. It is also important to note here that all future video clips (including these) will be Windows Media Files only, as there are easily downloaded Windows Media Players for all Mac operating systems. Click here to go directly to the Microsoft site for the Mac downloads (about halfway down the page). The WMVs are superior per byte in both visual and sonic acuity and we have decided that the extra baggage and lower qualities of the MPG compression no longer have any logical justification for the amount of space they consume. We are including MP3s of each of the following as well. Both media types can be used and downloaded by all of our readers for there personal use only. Retailers and Sheppard of course are free to use these works to demonstrate the sonic character of his instruments. For all commercial sites, the following strictly applies: (In all cases credit must be give as to source of these clips and the files may not be used or altered in any way as per the copyright notice below without written consent of Fingerpick Magazine). So now that our attorneys have earned their money, sit back and enjoy the various tunings and simple ramblings on this sensational instrument. We tried to pick pieces that best highlighted the unusually robust tonal prowess of this instrument and, of course, have some fun as well. We hope you enjoy. We surely did!! There is serious magic in this instrument and an unusual amount of dynamic potential as well. Just got back from a trip and had a chance to head North a bit to Portland and visit Mike Doolin (www.doolinguitars.com) and John Greven (www.grevenguitars.com). Got a lot of great footage and audio of the work of these two masterful builders. We will share it with you in the next few days. 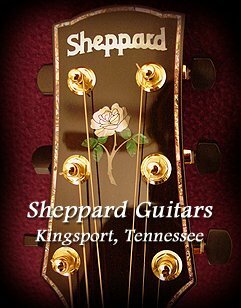 Check out their respective websites as they are, like Sheppard, most generous in the information they offer on the subject of guitars and building them. For now as a bit of a teaser, here is a really nice "living room" performance by Nancy Conescu of a Lisa Aschmann, Joni Bishop song. Nancy is known internationally for her Irish stylings but this song is really something special indeed. It all took place in Doolin's living room. Nancy asked that I not do a head shot of her while playing as she recently fell head first into a batch of newly sprouted poison ivy and her face looked like a big pizza. I'm sure she will recover soon. Besides I was there to see guitars not beautiful women. Needless to say, I had the opportunity to play and record a few nice guitars. Nancy, a total DADGAD addict, is playing a Doolin that Mike designed for her specifically to address some shoulder problems. I guess he could build her a Cocobola to enhance her relationship with poison ivy. (Just so you know, I am having a bit of fun at Nancy's expense. There was no Poison Ivy Incident, the fact being that I went there to look at and play guitars and her appearance was an unexpected pleasure. But I came for the guitars and wanted to show them as closely as possible - just so you know). Her talent speaks for itself as does her generous sense of humor. Anyway the guitar she is playing is a unique "wedge" design and has a beveled arm rest as well as a beveled bottom. Very comfortable on the upper body and legs, not to mention the ears. Nancy's clip follows and there will be more soon, including more details on this ultra comfortable "wedge" design and another Doolin creation as well. And don't forget below a very nice look at and sounds of John Greven's highly regarded and strikingly unusual looking Prairie States. From this session, many sights and sounds will emerge. Soon too. First off, enjoy a very nice song and performance. Nancy's clip will eventually end up in the Video Demo Section and there are three new videos below Nancy's that are a nice first taste of the Doolin instrument. We promised to show our readers more of the guitars I played and recorded in Portland. We will over time supply you with more details and our impressions but for now here are three videos of Mike Doolin's OM double cutaway. Lacewood and Cedar. Enjoy!!! Remember you Mac folks need to download the newest Windows Media Player for Mac. Either platform can listen to the MP3's. By the way since Fingerpick Magazine's real interest is generating expansive new talent, talent that can make a living with music, especially in the creative arena, please note that the first clip is a medley of classic melodies that should begin to give you some idea of the melodic power of first position G and C standard progressions. A very large, surprisingly so, number of timeless melodies can be played in these first position progressions. There is something about the guitar that makes it an ideal platform from which many new innovative melodies can be launched. So while it is wise to explore the entire neck and the rich range of chords that are available between the 12 frets, never doubt that a lot of stunning music awaits to be written in this simple first position. An MP3 is here as well to listen to. Capo is on the 3rd fret. Mike's guitars, like the Sheppard, are really conducive to the creative process and while we only touch on these melodies, let your imagination flow. Whether it is Lennon/McCartney, Andrew LLoyd Webber or the traditional favorite, Waltzing Matilda, there is a lot of magic in easy reach of five frets. We expect you to find yourself focusing on creating just such melodies of your own and very quickly at that. Experiment with other familiar melodies. You will find most are playable within this range. Almost everything you will hear in the pages of Fingerpick Magazine are original works. They are for the most part melodies and wanderings that occur to me when I play - when I try out a new guitar. I really don't like playing the same song twice exactly the same way and often when I sit down to play, it is for my pure enjoyment and thus I want to continually hear something new. Don't we all? I copyright these every month or so and have been doing so as parts of musical plays for a long time. Saves a lot of the hassle of doing it one song at a time. Still it is important when demonstrating guitars - (we have no intention of doing critical reviews of instruments as we find that to be a much too subjective endeavor and one that is filled with personal prejudice that could be mistaken for agendae) to play enough of similar ranges so that one can compare and fathom the tonal properties of each. All of the instruments we will record are special. If they are not, we won't play them here. Each has its own character and I personally try to keep the playing simple enough for you to hear the instrument rather than demonstrate how many notes I can play per measure. I find that when trying out guitars, the lingering tones and nuances of each instrument, tell me a great deal more about the guitar. Busy work on the fretboard tends to hide these special nuances that each instrument provides. This is not an audition for me. This is an audition for each guitar as many of you may never hear these instruments up close. They are not mass produced and are hard to find at times. Many must be commissioned to be built and the wait can be 6 to 9 months. The don't come cheap ($3500 to a lot more). This can make decisions difficult for many and even the great reputation of these builders may not be enough for one to enter into a building agreement. We hope the MP3s, which are higher audio resolution files, are sufficient to demonstrate their sonic potential. The videos should demonstrate the ease with which these instrument can be made to sing. All of these builders are a special breed who have dedicated a great portion of their life experience to producing the finest instruments possible. It is our hope you will appreciate what you hear and see in that context. What follows is another set of perfromances on the Doolin. This double cutaway engineering marvel has a lot more to offer than simply striking looks. Its extended fret reach is truly functional and the possibilities are enhanced for highly effective upper register playing. Please keep in mind as well that these instruments belong to someone or are in the process of being shipped, so extreme care was taken during the recording session to take it very easy on them. Were the Doolin you are hearing mine, I would have raised the action a bit and really got on it. I don't abuse guitars but I do tend to let the adrenaline flow naturally when playing my own instruments. However, even with light careful playing, its prowess is unmistakable. Enjoy! Remember the instrument will always be the star of the show in the Acoustic Guitar Section. The finale video focuses on some simple applications of some of the currently popular alternate tunings to demonstrate the range and composure of this instrument to perform in such an arguably unusual environment. These tunings (there are a lot more as well) really do challenge most guitars, especially their low frequency clarity as well as the high end intonation. The Doolin, like the Sheppard, was a joy in both cases. Were they mine, I must admit that the Doolin would get the more aggressive beating and the Sheppard would get the sweeter parts but either would perform the other task very well indeed. Two different instruments by two master builders. I want them both. Who wouldn't? One last bit of history. Mike and I have known each other (by phone) for nearly 5 years. We first talked when I was testing B-Bands with clay for balancing and knew he was using them in his guitars. We have had many conversations and he feels truly like a friend. Even though we are only about 4 hours or so apart, both in Oregon, we had never physically met. I must say it was a pleasure. As we move Nancy's Video above to the Video Demo page, it will be accompanied by Mike himself playing. You see, he not only builds the things but can play them beautifully as well. Now on to this last clip. John Greven has one of the most extensive, well rounded histories in the handbuilt guitar business. You can read all about him on his website www.grevenguitars.com, but the knowledge he gained from years of restoring old Martins and the like at Gruhn Guitars in Nashville, gives him a distinctly different outlook on instruments. He has seen a lot of weird stuff. His Prairie State is an unusual looking guitar with a very wide lower bout (17 1/4") but sits quite comfortably in the lap. It looks big but feels intimate. It is a bit thinner than standard. I played this instrument even less and even more carefully as unlike the Sheppard that was Gerald's personal guitar and the Doolin which belonged to a friend who generously agree to have me play it, the Greven was due to be shipped to its new owner the following day. This man, who so many months ago made the committment to have it built, who waited so patiently for this beauty to arrive, was certainly not going to be disappointed by me banging it around. The action was set up per owner instruction very low with light gauge D'addario's and consequently, for ideal sonic demonstration, I felt a capo on the 4th fret was the best compromise for going easy with the overwhelmingly powerful bottom end. I knew if I started playing it open it would have been hard to resist pedal to the metal. This guitar just begs to be wrung out and the new owner must be in a state of pure ecstacy by now. Again, I wanted no part of causing the instrument to be anything but in brand new condition. Guitars of this sort including the Sheppard and Doolin open up pretty quickly. They don't require the break in time of say, a new large Martin. Still I was very careful indeed and played a simple melody I created years ago that would still demonstrate the instrument's power and beauty even from a 4th fret capo position. The Prairie State has gotten a lot of attention on forums and in other more endearing circles I travel and it was with great anticipation that I began to play it. At first it reminded me of an old J-200 Gibson. It had that soft DEEP sound with no bark and I wasn't about to make it bark. After only a little playing however, there were overtones reminiscient of old large body Martins streaming out of the sound hole especially with the higher notes that the J-200 never really mastered. I never did get to play it enough to figure out precisely its potential but I must say that what I eventually heard was unlike anything I could remember hearing before. Big sound, easily obtained. Jeez, how I would have loved to jump on it with some power fingerpicking and dropped D percussion. I restrained myself admirably I think and the result was that the instument was still able to express itself amazingly. It was a rainy day in Portland and there was some traffic on the street so I miked both the Doolin and the Greven fairly closely. Amazingly enough neither broke up the condenser. They sure could have if I had applied even a little more pressure but again, I was a good boy that day. I wore headphones throughout the session to make sure the dynamics remained within tolerance. Enjoy the recordings. In the future we will take the native 24/96 files we recorded and archived on the Masterlink and mix them with some strings and keyboards so you can hear how instruments like the Greven, Doolin, and Sheppard fit into wonderfully rich mixes. And finally my sincere thanks to this Greven's new owner for the opportunity to assault its virginity. I was ever so gentle. And it was beautiful.